There are days that dinner stumps me. Even with my towering pile of notes and recipes for things I want to make one day, even on days when I have something all planned out but then I realize I’ve forgotten that one crucial ingredient…there are just Those Days. And that’s why I always have a good supply of tuna fish in my pantry, because even on Those Days, tuna never, ever lets you down. 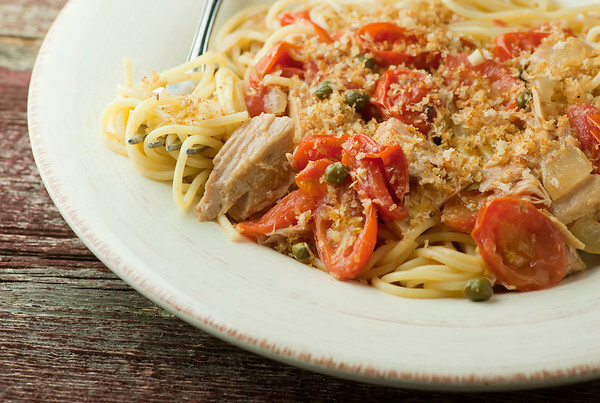 And while I am perfectly cool with serving the Southern husband a perfectly nice tuna salad for dinner, a few weeks ago I whipped up this ridiculously easy tuna pasta with tomatoes and capers and crispy bread crumbs, and once again I remembered the happiness of tuna in the pantry. Now, there is one non-negotiable point about this dish, and that is that you are going to have to get tuna packed in oil. None of that meek and milk water-packed stuff…you want the rich flavor that comes with bold and delicious oil-packed tuna. You can drain most of it off, don’t worry, and the flavor is like night and day. The canned version is just fine, but if your supermarket carries the fancy tuna in a jar, it’s worth going for it now and then – it’s a little expensive but as they say, you’re worth it!! I had all the other stuff in my kitchen already and these are all items that I highly advise having around at all times for culinary emergencies: capers, an onion, cherry tomatoes (I always buy a carton of these every week – they are sweet and perfect all year round and if I’m not cooking with them I am snacking away on them! ), parmesan cheese, a lemon (always have a lemon on hand. You never know!) and of course pasta. I start by making the bread crumbs…make ’em fresh by whirling a slice or two of fresh break in your food processor and toasting the crumbs in skillet with a little olive oil, salt and pepper until they are golden. Test them, and then tell yourself sternly that you need to save some for the pasta. I would never have thought bread crumbs could be addictive before I made my own. On to the pasta. The onion and the cherry tomatoes get cooked up in a little olive oil until they are lovely and soft, and then you make a quick sauce out of them with some water from the pasta pot and a handful of parmesan. Once that’s done, it’s only a matter of tossing the pasta with the sauce, some capers and the tuna. Now divide it among plates and drizzle it with a little fresh lemon juice and a scatter of those bread crumbs. See? Tuna to the rescue. Works every time! Make bread crumbs by heating 1 tablespoon olive oil in a medium skillet over medium high heat. Add fresh crumbs with a pinch of salt and a couple grindings of fresh pepper. Stir until golden and crispy, about 3-5 minutes. Set aside. Cook pasta according to package directions in salted water. Reserve 1 cup of water and drain. While the pasta is cooking, heat the remaining oil in a large deep skillet over medium high heat. Cook the onions until softened, about 10 minutes. Add cherry tomato halves and cook another 5 minutes or so until softened. Add cheese and stir, and then drizzle in just enough pasta water to form a light sauce (you might not need all of it). Add pasta, capers and tuna and toss until everything is combined and heated through. Divide pasta among plates, drizzle with fresh lemon juice, garnish with bread crumbs and serve. I recently realized that crispy bread crumbs are just…magical. So magical. They are! I have to stop myself from putting them on EVERYTHING. It was, and ridiculously easy to make…the perfect combo! Ah, another tuna lover! Not a breadcrumb person, probably because no one in my family ever used them as I was growing up. But capers! And tomatoes! Right there you have found heaven. And this would make an excellent cold pasta salad, too, with a little shaved Parm instead of grated. Thanks, Kate! Kate, If you could recommend a good oil packed tuna, I would really appreciate it. Thank you, in advance, for your time and consideration — Also, many thanks for the time and effort you put into your wonderful blog!